DentalVolunteers.com is your window to the world of charitable dental work, performed by career professional dentists with a commitment to the greater good. Join us! Over many years, the Children's International Dental Project established itself as a 501(c)(3) non-profit organization, branched out to other countries, and reached out to many needy children. Across the globe, this group of dedicated professionals has done a "world of good" for dentistry in general, and especially for their grateful patients worldwide. Please browse this site to learn more about what has already been accomplished, as well as for future opportunities in which you might share. 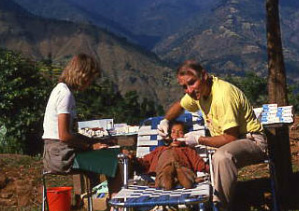 The Children's International Dental Project began in 1987, after Dr. James Orban had trekked and hiked in Nepal two years earlier. The CIDP's vision is to provide dental care for poor children, street kids and orphans in homes, hospitals, and community centers. Adults are also offered treatment, but children are always our first priority.